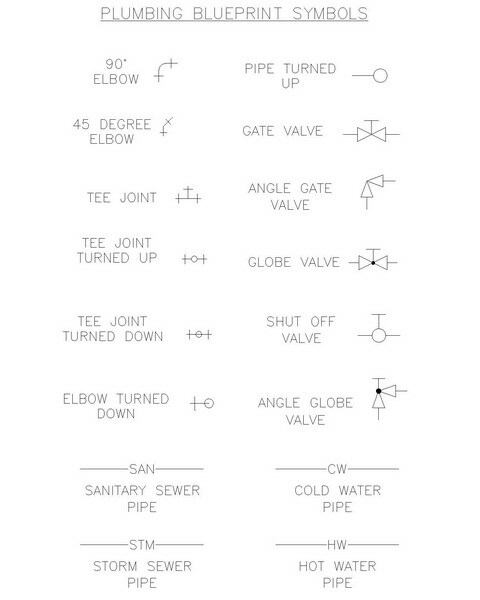 Plumbing symbols are used on technical drawings to represent the location of certain fixtures, such as plumbing faucets, valves, pipes, etc. It is necessary to identify these plumbing items, on house and building plans, in order to ensure that all tradesman involved on a project are clear on where water pipes, drainage pipes, shut off valves, and other plumbing objects will be installed. A plumbing drawing is also very useful to contractors when performing plumbing estimating to determine construction costs. Often times, contractors from different trades will discuss engineering and architect's plans in a meeting to decide if there may be conflicts between architectural, structural, electrical and mechanical (including plumbing) trades. After reviewing contractor concerns, and depending on which stage of construction the project is at, the designer may decide to relocate certain plumbing related icons on the drawings to let the builders know that an amendment has been made. If you are a home builder looking to understand what these symbols mean, the following diagram may help you when dealing with a designer or contractor. If you would like to download and print the following chart, scroll to the bottom of the page where you will find a link to the .pdf file for your use. Visit here to receive a free copy of the above plumbing blocks to print. Remember to keep the lines of communication between you and your plumbing contractor and designer open to avoid costly changes down the road. If you are not sure what some of the symbols mean, or what they represent, be sure to discuss your concerns.